We can't be taken in by good looks. We know that looks fade, and there must be an inner beauty. 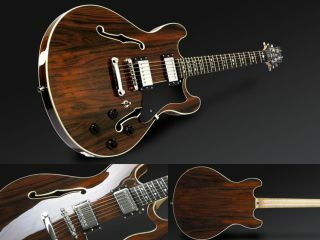 There must be a...on the other hand, the Framus Mayfield Custom Brazil Rosewood is one fine-looking guitar. This upgrade from the Mayfield Pro features a high-polish finish, a laminated AAA Brazil rosewood body (top, back and sides, the same as our hair) and a tigerstripe ebony fretboard with custom mother-of-pearl inlays. The original Seymour Duncan pickups offer a vast variety of unique, semi-acoustic sounds that are suitable for any style of music. Other specs and features include celluloid binding around top, back and f-holes, a flamed maple neck, 22 jumbo frets, a scale length of 24.75 inches, two volume and two tone controls, Tune-o-matic bridge with stop-tailpiece, and chrome hardware. You can even get a left-handed version at no extra charge. The question on everybody's lips, of course, is this: Does the Mayfield Custom Brazil Rosewood sound as good as it looks? We might have to see about that. It could take a while, though - we need time to look at ourselves in the mirror with it strapped on. In the meantime, for more information, such as pricing, be sure to visit the official Framus website.